A curious emu keeps an eye on me as I make this photo from a relatively close distance. 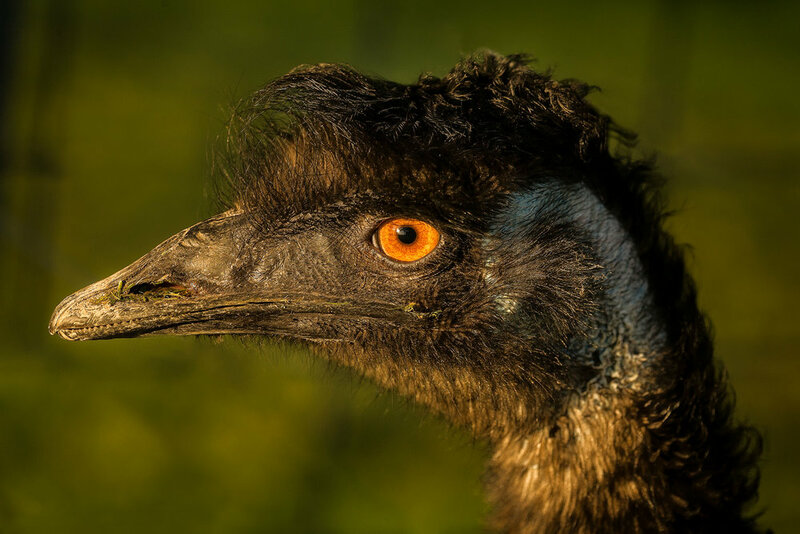 This straightforward image of an emu was made from a relatively close distance. I'd guess I was only about a meter away when I photographed the emu by poking my camera lens through the top layer of a wire fence. While a potentially dangerous animal in the wild, this particular emu spends its days on a small farm and, while not exactly domesticated, it has, to an extent, become somewhat accustomed to humans. Frankly, emus scare me. I was both glad there was a fence between us and I was ready to pull my camera away, at a moments notice, should the emu decide to take a peck at any shiny reflection on the front of my camera's lens. A fascinating animal with a steely gaze, the placement of its eyes within its skull allowed the bird to simultaneously present a profile while looking directly at me. Spooky! Photographing with direct, early morning light provided a wonderful soft light that illuminated the color of the bird's eye and the delicate textures surrounding it. I made the image with a Canon 5D camera and Canon EF 180 mm f/3.5 Macro L series lens at an aperture of f/5.6. At the relatively close camera-to-subject distance in question the lens and aperture combination in question produced a lovely shallow depth of field. It was bright and the subject was lit directly by the low angle of the sun providing me with a 1/500 second shutter speed at ISO 400. That made it possible to hand hold that quite heavy and slow to focus (non image stabilized) lens quite steadily. Image processing was conducted in Adobe Lightroom and Adobe Photoshop.